Today’s post comes from Amy Sullivan. Amy has just published a book titled When More is Not Enough – How to Stop Giving Your Kids What They Want and Give Them What They Need. This book is a fantastic resource for families filled with practical ways for you to start serving your community. She shares her own family’s journey into serving with a tone that is light, often humorous, and definitely not guilt-inducing. When we talk about creating communities of kindness, I think of this book as a great resource. I’m excited to give away one copy to a reader! Be sure to enter at the bottom of this post. And if you don’t win, go pick up a copy. You wont’ regret it. Now, please enjoy Amy’s story of how a friend showed creative kindness to her during a low season of her life. At one of the lowest points in my life, a friend showed up at my house. I heard her turn her car off. I also heard the heels of her boots click as she walked up my sidewalk. Then I heard her knocking, but I pretended I didn’t. Instead, I pretended to sleep. I listened to my friend turn the handle of my front door back and forth, back and forth. It was locked. We lived in a bad neighborhood. Therefore, our door was always locked. At that moment, I loved our bad neighborhood. Maybe my friend would think I ran to the 7-Eleven to drown my sorrows in a biggie sized Diet Coke, and maybe then she would go away. Ding dong, ding dong, ding dong the doorbell rang. I slowly made my way down the stairs. Maybe she will give up if it takes me too long to answer the door. Ding dong, ding dong, ding dong the doorbell sang. I opened the door and saw her standing there with a brown grocery bag in her arms. I’m not sure I said hello. Instead, I sat on the couch, and my friend went to my kitchen. I watched as she dug through my cupboards and pulled out bowls. I stared as she unpacked the grocery bag. She pulled out whipping cream, lemon, cinnamon, and three kinds of berries. She poured half and half into a bowl with sweet cream and cinnamon, and then whipped-up the creamy mixture and sprinkled berries on the top. My friend and I sat in silence and ate our parfaits together. Words weren’t exchanged. Everything we could have said sounded cliché. Instead we scooped up our parfaits and listened to the spoons clink on our sundae-sized glasses. When I think of kindness, I think of this story. I think about showing up and giving someone something they need if even they don’t know they need it, even when they don’t answer the door. Kindness is the idea of compassion, generosity, and thoughtfulness all wrapped-up together and sometimes it even comes in oversized, sundae glasses. Amy L. Sullivan just released her first book entitled When More is Not Enough: How to Stop Giving Your Kids What They Want and Give Them What They Need. She writes for oodles of online and print publications. She’d love to connect with you at AmyLSullivan.com. Write down names of people you can show kindness to this week. Ask God, through His Holy Spirit, to grow the fruit of kindness in you and your community. Pray for God to open your eyes to people around you. 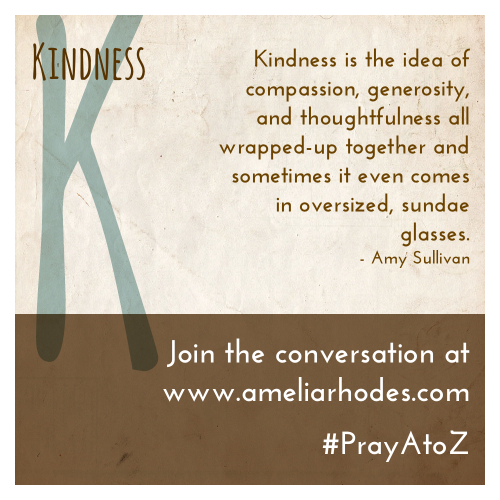 As we #PrayAtoZ, K is for Kindness. Enter the Giveaway for 1 copy of “When More is Not Enough” by Amy Sullivan. The first incident that comes to mind was when my son saw a man in the library drop a five dollar bill without realizing it. My son picked it up and returned it to the man. The man said my son could keep it, because he was being honest by returning the money, and honesty is an important quality to have. I thought that was so sweet! Rarely happens these days .. Thank you for this post, and for the giveaway! Oh what a beautiful story!! Thanks for sharing with us, Kate! That was so sweet! What a perfect way to share about kindness. Thanks so much for reading, Kate! What a great story Amy. It reminded me of a similar moment, after the birth of our first daughter, when I was feeling overwhelmed by the newness of it all and a friend stopped by with muffins and found me in tears on the kitchen floor. We sat and ate our muffins in silence, but by the end we were laughing about the craziness of life and motherhood and I was so thankful for her kindness and friendship. Oh I love this! So often we think we have to do “big” things, but sometimes all we need are muffins and a friend. Thanks for sharing!! Isn’t it funny when we don’t know what to do, food is a go-to? For some reason, muffins (and in my case, parfaits) make it better! Thanks so much for reading and taking the time to comment, Lisa. This is a wonderful post! (I posted about kindness yesterday. In the wake of elections and unkind words seen online, I felt so compelled. Great minds…) I can’t wait to read your book, Amy! I can’t wait to pop over and read your post. How funny you just wrote about kindness yesterday! Thanks for the encouragement about the book! Melanie, what a great post topic for the post-election season! When we were young and in ministry… I was so hesitant. I learned so quickly it really is just showing up. Sometimes there are no words, but the showing up means everything. Sign the funeral registry, offer the hug, just sit. Simple and beautiful. So practical, so simple, and quite invaluable! Perfect way to put it, Lisa. Just show up. Your friend is an inspiration, Amy! I’m not sure I would have kept ringing that door bell. I’ve been debating all day about bringing dinner to a friend whose father-in-law is in a coma after having brain surgery this week. Why do I assume I’ll be more of inconvenience than a blessing? That’s the evil one, trying to discourage me. Thanks for sharing this today – gotta go, I have a dinner to deliver! Blessings!